Please note – this is and has always been a free pattern – i shared it only because I loved my own results, but there’s no gauge, there aren’t any row counts, and I am crap for support questions (you get what you pay for, lol – Ravelry forums are *awesome* though). If anyone wants to have a go at that, by all means, it just can’t be me. I was nesting like crazy when i knit this hat (I was 7 or 8 months preggo in the photo above), and the egg is now a lanky seven year old with teeth everywhere. Arrow’s a quickie and uses less than 200 yards of yarn. The stitch pattern is simple enough for a beginning knitter who feels comfortable working in the round. 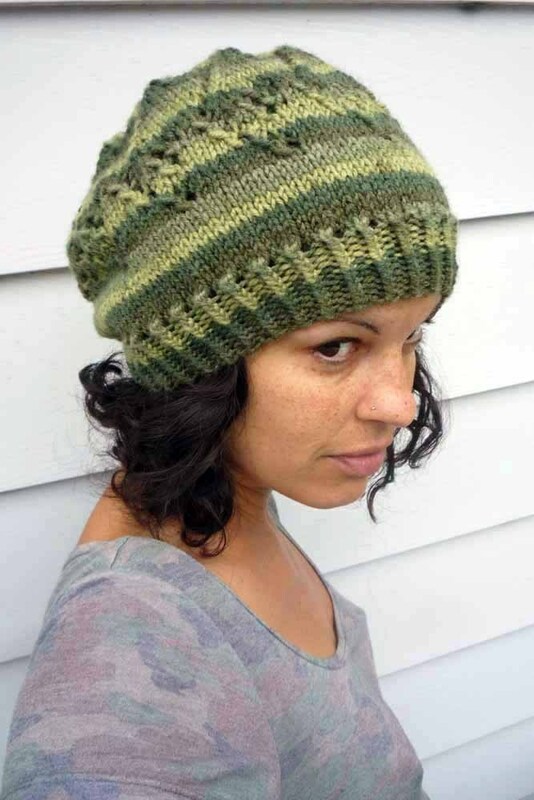 The pattern starts at the twisted-rib brim. To get the cool stripey thing, i used Plymouth Encore’s Colorspun worsted in “Emeralds” (colorway 7148) and had about a third of a skein left over. Feel free to use whatever worsted weight yarn you want, preferably a wool or wool blend. The Ravelry pattern page is here if you wanna queue it up, add it to your faves or any of that fun stuff. There’s also a “print friendly” button at the end of this post – click it, and you’ll have a nicely-formatted, printable option for, well, printing, or PDF. Note: Make sure you’re doing “k1-tbl, p” for the twisted rib. * I made this abbreviation up – in a “normal” situation, you knit into the back of this stitch in order to tighten this stitch and lessen a “hole” – however, I’ve knit into the front specifically to make this hole visible as a design element. *k1-tbl, p1; repeat from * to eor. *k2, M1-F; repeat from * to eor. 117 stitches. Round 1: *k2, yo, sl1, k1, psso, k5; repeat from * to eor. Round 3: * k3, yo, sl1, k1, psso, k4; repeat from * to eor. Round 5: *k4, yo, sl1, k1, psso, k3; repeat from * to eor. Round 7: *k5, yo, sl1, k1, psso, k2; repeat from * to eor. Round 9: *k2, yo, sl1, k1, psso, k2, yo, sl1, k1, psso, k1; repeat from * to eor. Round 11: *k1, (yo, sl1, k1, psso) twice, k2, yo, sl1, k1, psso; repeat from * to eor. Round 13: *k2, yo, sl1, k1, psso, k2, k2tog, yo, k1; repeat from * to eor. Round 15: *k5, k2tog, yo, k2; repeat from * to eor. Round 17: *k4, k2tog, yo, k3; repeat from * to eor. Round 19: *k3, k2tog, yo, k4; repeat from * to eor. Round 21: *k2, k2tog, yo, k5; repeat from * to eor. Round 23: *k1, k2tog, yo, k3, yo, sl1, k1, psso, k1; repeat from * to eor. Round 25: *k2tog, yo, k3, (yo, sl1, k1, psso) twice; repeat from * to eor. Round 27: *k1, yo, sl1, k1, psso, k3, yo, sl1, k1, psso, k1; repeat from * to eor. Round 30: *k7, k2tog; repeat from * to eor. Round 32: *k6, k2tog; repeat from * to eor. Round 34: *k5, sl1, k1, psso; repeat from * to eor. Round 35: *k4, sl1, k1, psso; repeat from * to eor. Round 36: *k3, sl1, k1, psso; repeat from * to eor. Round 37: *k2, sl1, k1, psso; repeat from * to eor. Round 38: *k1, sl1, k1, psso; repeat from * to eor. Round 39: *sl1, k1, psso; repeat from * to eor. As always, this pattern is for your personal use and, as with everyone else on this weblog, is protected by copyright. If you like this pattern and choose to knit it, I’d really love it if you’d add it to your Ravelry projects. It’s been fun seeing this hat continue to pop up over the years. Hi Dori! Love this pattern! Just wondering if you used one whole skein? I have skein of manos wool clasica – 138 yards/100 grs and I am not sure if it will be enough yarn for the hat. Thanks so much for the quick response! I am looking forward to getting started on this hat!! Do you have a guage for this project? Would be much appreciated; couldn’t find anywhere. Thanks. I don’t, sorry! I never gauged myself. Are rows 15 and on meant to be decreasing rows? I think my stitch count must be wrong because the pattern does not go evenly to the end of the row on those ones. Any advice? How many stitches should i have at that point? Can’t wait to make the hat correctly – it’s so pretty. Hey there! I will pull up the pattern on my phone and see if I can’t help but I am not sure if I can (away from needles, yarn and computer at the moment). You can also try the ravelry forums 🙂 over 100 people have knit it already! I was wondering what the repeat count was for this pattern. I cast on w/78, but the hat is coming out very small. I would like to increase the cast on, but need to know the number to increase. After the increase k2,M1-F, repeat to eor I have 117 not 108 Sts. Nice pattern, beautiful hat! Please note that after first increase round, you have 117 stitches, not 108 as stated in the pattern. I frogged twice before I did the math! End result was very nice!! So how did you fix the problem with the 117 stitches? I`ve just knitted this hat. Very nice pattern. Love it. Its something wrong with my camera, but I will put it in my projects on Ravelry when its fixed.